NIIGATA (TR) – The management agency of idol group NGT48 last month apologized to the Niigata Prefectural Government over its handling of the assault of group member Maho Yamaguchi last year, it was learned on Wednesday, reports the Sankei Shimbun (Apr. 10). On March 29, Natsuko Yoshinari, Representative director of agency AKS, and Maiko Hayakawa, the manager of NGT48’s theater in Niigata City, apologized to vice governor Hiroshi Mizoguchi and a member of the prefecture’s public relations department at the government office. “Due to our initial handling of the incident, we lost the trust of the people of the prefecture,” Yoshinari said. The incident emerged via a series of tweets by Yamaguchi on January 9. 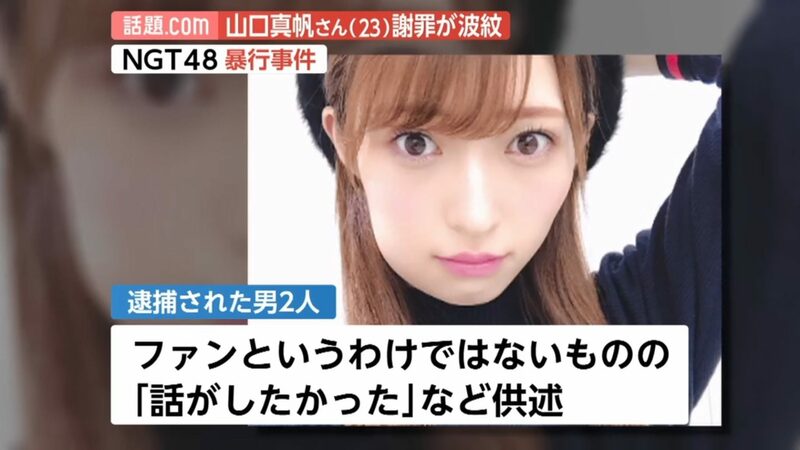 In the tweets, the idol said that two men grabbed her by the face and shoved her down as tried to close the front door of her residence in Niigata City after she returned home alone from a show on December 8. According to previous reports, Niigata Prefectural Police accused the men of assault after the incident. During questioning, the pair denied the charges, saying they merely wanted to speak with Yamaguchi. They were released on December 29. In one tweet from January, Yamaguchi said that that the perpetrators told her that it was at least one member of NGT48 who informed them of her schedule and where she lives. Last month, AKS revealed that the results of a third-party inquiry into the matter showed that some members indeed had relationships with fans but that the cause of the incident was “excessive” behavior by the two fans. Upon the release of the results, Yamaguchi blasted the announcement, saying that AKS “was telling lies.” She also claimed that AKS had promised to dismiss any members who were proven to have ties with fans. AKS came under fire over its indifferent handling of the incident, refraining from commenting until Yamaguchi took to Twitter in January. The agency then announced that Hayakawa would replace Etsuro Imamura as the manager of the theater. Last month, AKS cancelled its annual popularity contest that features flagship idol group AKB48. In the lead up to the General Election, fans “vote” for AK48 members and those of sister groups, including NGT48.